Featuring a unique collection of fabled castles, secluded lodges, storied meeting places and modern retreats, Fairmont Hotels & Resorts opens the doors to some of the world's most celebrated addresses. With locations in ten countries, our 50 distinctive hotels - including The Fairmont San Francisco, The Fairmont Banff Springs and London's Savoy - promise travelers rich experiences and lasting memories in unparalleled settings. Fairmont Hotels & Resorts gift cards can be used for accommodations and more, including spa services, dining or golf, tennis and other leisure activities at any facility managed by Fairmont Hotels & Resorts. Furthermore, gift cards can be used at any Fairmont Store location. For in-house guests, any charge that can be applied to a hotel folio can be paid for with your Fairmont Hotels gift card. Fairmont Hotels & Resorts Gift Cards are not replaceable if lost, stolen or destroyed. Fairmont Hotels & Resorts Gift Cards may not be valid where restricted by law. Fairmont Hotels & Resorts Gift Cards are not redeemable for cash and are void if sold for cash or other consideration. Any tax liability, including disclosure, connected with receipt or use of this card is the recipient's responsibility. Locations listed on card are subject to change without notice. Cards are fully transferable and combinable. 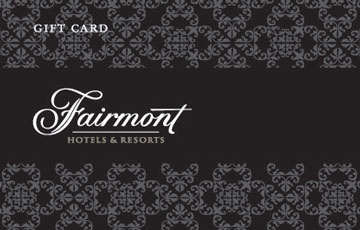 Please visit http://www.fairmont.com/promotions/giftcardterms for full terms and conditions.